Benjie has designed this tee shirt to raise money to protect Hong Kong school kids against homophobic bullying. 50% of the total money raised from the sale of this tee shirt will be donated to Mr. 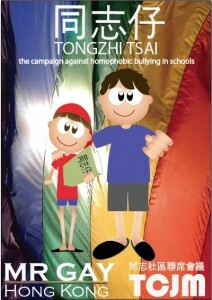 Gay Hong Kong’s anti-bullying project – Tongzhi Tsai. If you would like to support this project, please send an email to place your order. Available in sizes S/M/L/XL, each tee costs only HK$80. Stocks are limited and so click here to email Benjie. Thank you!